United Fishermen of Alaska (UFA) announces the transition in its leadership effective April 15, with the election of Matt Alward succeeding Jerry McCune as president, Bob Kehoe replacing Alward as vice president, and new executive committee members Rebecca Skinner and Sue Doherty. Jerry McCune has served most recently as UFA president since 2014, as well as from 1992 to 1996, and has served as a paid or volunteer lobbyist for UFA throughout the past two decades. He was named to the UFA Alaska Seafood Industry Hall of Fame among the initial inductees in 2009, and will continue to serve on the UFA executive committee. Matt Alward represents North Pacific Fisheries Association on the UFA board and has served as vice president since 2015. Bob Kehoe of the Purse Seine Vessel Owners Association will serve as UFA vice president, after two years as Admin committee co-chair. New UFA executive committee members include Rebecca Skinner as Subsistence Committee chair and Sue Doherty as PR & Membership chair. Skinner represents UFA member group Alaska Whitefish Trawlers Association and was recently selected as a member of the Kodiak region federal subsistence regional advisory council. New PR & membership chair Doherty represents the Southeast Alaska Seiners Association on the UFA board. 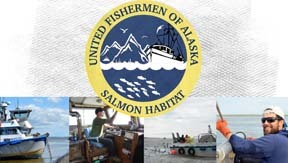 United Fishermen of Alaska is the statewide commercial fishing trade association, representing 35 Alaska commercial fishing organizations participating in fisheries throughout the state and adjacent offshore federal waters. More information is online at www.ufafish.org .